Abdel Fattah el-Sisi has rescued Egypt from chaos, but the country’s president, to be elected in the March 26-28 elections, will face numerous challenges. Modernizing Egypt will require farsightedness, determination and political will, writes Valdai Club expert Tarek Heggy. The main achievements during the first term of Egyptian President Abdel Fattah al-Sisi (2014-2018) have been mainly in two domains: security and infrastructure. The domain of security included the salvation of the Egyptian people from the radical rule of the Muslim Brothers who are the custodian of radical Islam and terrorism. It also included maintaining Egypt’s relative security in a far from secured Middle East Region. Such a non-stop task included 24 hour a day monitoring of all the borders of Egypt, particularly with Libya, Gaza and Israel. For the overwhelming majority of the Egyptian people, security is a more important priority than anything including democracy. In parallel, President Abdel Fattah al-Sisi obviously kept Egypt quite far from the anarchy that prevailed in a number of Middle Eastern countries such as Libya, Syria and Yemen. In a way, one could say that while President Putin rescued Russia from the gigantic disorder that prevailed throughout the 1990s, President Abdel Fattah al-Sisi similarly rescued Egypt from a bloody disorder such as the devastating chaos which ruined Libya, Yemen and Syria, a chaos that was not only blessed but obviously supported by the USA and the EU in general and by specific figures such as Hillary Clinton in particular. In parallel to the focus on securing Egypt, President Abdel Fattah al-Sisi launched unprecedented projects of modern infrastructure in all sectors: power generation, roads, flyovers, gigantic tunnels, etc., that are imperative to a full-scale economic jump. 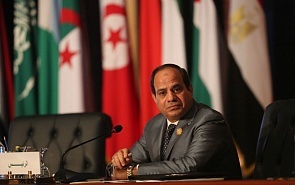 In addition to his achievements in these two vitally important areas, President Abdel Fattah al-Sisi put an end to a relationship with the USA which many perceived as downgrading and humiliating to Egypt; an affiliation existing since the late President Anwar Sadat decided (since 1974) to be a follower of the USA, from all political and military standpoints. A new trend has now been established, expressed in different forms. For instance, during the past four years, Egypt’s army has significantly improved in most categories to be the tenth strongest army in the world. This achievement was coupled with the fact that Egypt was, for the first time in four decades, acquiring non-American strategic weapons from Russia, France and other destinations. Such an independent policy allowed Egypt for the first time to lead an anti-USA campaign in the United Nations concerning President Trump’s decision to move the US Embassy in Israel to Jerusalem. In the years 2014-2018, Egypt under President Abdel Fattah al-Sisi got closer to Russia both politically and economically, which was supported by a strong pro-Russia sentiment among the non-Islamist Egyptian population which has never sympathized with the affiliation to the imperialistic USA. Today, the majority of the Egyptian people yearn for more coordination and cooperation between Egypt and Russia in all spheres. The first Egyptian nuclear power plant that Russia will help Egypt to construct and manage is an example that many Egyptians long to see replicated in other economic fields. The main challenges that both Egypt and its President will confront during the upcoming four years are as follows: (1) to continue what has been achieved in the security and infrastructure domains over the past term, (2) to succeed in attracting local, regional and international bodies to hugely invest in Egypt, and (3) to deploy Egypt’s gigantic soft power to further strengthen modernity in Egypt against the strong atavistic wave of Islamism that has been hitting the Middle East and North Africa region for four decades. This is a task that requires farsightedness, determination and political will to challenge a very strong anti-modernity theocratic culture.